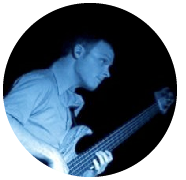 I'm Arcellus Sykes, a freelance bassist and transcriptionist residing in Portland, OR. For more information please visit arcellussykesmusic.com. I began transcribing music as part of my own jazz studies when I was in high school. Closely listening to and analyzing a piece gave me a special insight into the inner workings of music. Since then I've grown to love the process of creating a tangible document (sheet music) of a piece of recorded music that may not be available elsewhere. I'm excited to offer this as a service to my clients and I'm very proud of the high-quality product I'm able to provide.